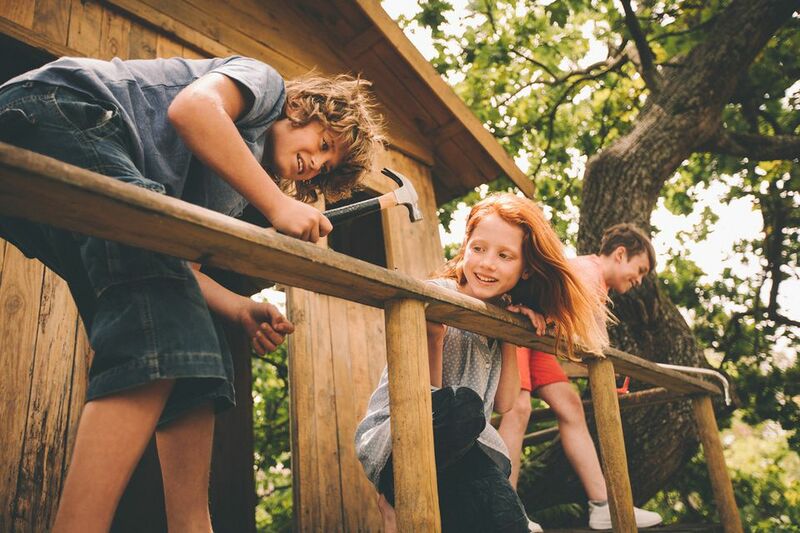 Detailed diagrams, color photos, videos, step-by-step building instructions, and tips will help you build a safe and sturdy tree house that your kids or grandkids can enjoy for years. Tip: No good tree house trees? No problem! Most of these free tree house plans include an option for a free-standing tree house that sits on posts. You can also find some free playhouse plans, and free swing set plans that may meet your needs better. When you're ready to move on from tree houses and onto your next woodworking project, you can find more free woodworking plans for toy boxes, bunk beds, sheds, deer stands, dog houses, picnic tables, birdhouses, gazebos, porch swings, and bookcases. If you are out to build an amazing tree house, then this free tree house plan is the one for you. Don't worry if you don't have the right trees for a tree house. This free-standing tree house can be built anywhere. Outside this tree house is a pulley system for treasures and a ladder. Inside there are bunk beds and plenty of room to play out adventures. Plenty of color photos, diagrams, and written directions will help you build this tree house hideaway that any kid would love. A master cut list and supply list are available for this free tree house plan as well as separate blog posts how to build the deck, the walls, railing and shutters, and the roof. For $300, Made With Happy build this high-quality low to the ground treehouse for the kids to play in all summer long. There's a breakdown on how to build the base and frame, floor, roof, and walls and window. Popular Mechanics has this free plan for building a "World-class backyard tree house." There's a handful of images and lots of text in this tree house plan, so you can't skim through the steps like you can with some of the other plans from above. Here's a fairly simple DIY tree house plan that is a sturdy but wonky platform that you can build within the trees. The free plan includes a list of materials, building instructions, and lots of color photos. If you're looking for an updated tree house plan, this free plan from Dornob will help you build a modern tree house with an unusual shape and windows from the tiny to the huge. Color photos, written instructions, and diagrams will help you build this unique tree house. Instructables has a lot of free tree house plans, but this one build by Makendo is a stand-out. It's a simple structure that needs a few trees close to each other for the build. It uses recycled fence posts for the sides and a tarp to cover the top. The plan includes lots of building instructions, color photos, and a materials list. Outdoor Life has a free tree house plan that will build an A-frame tree house with a wrap-around deck and ladder. This tree house is constructed out of 4x8 plywood sheets so that it can be built in a tree or free-standing. The free tree house plan includes detailed diagrams, instructions, and a materials list. Just be sure to click through the pages on the bottom of the plan so that you can see everything. This one comes from BuildEazy. This tree house includes a deck that wraps around the tree, stairs to the ground, a slide that comes off the tree house, and an attached swing set. You'll be able to view and download a materials list, cutting list, building instructions, and blueprints in this free tree house plan. Here's another free plan for a tree house. This one is a series of videos that will take you through each step of building the tree house. Pressure-treated wood in 2X8's with 4x4 posts makes this tree house safe for the kids and easy to assemble. 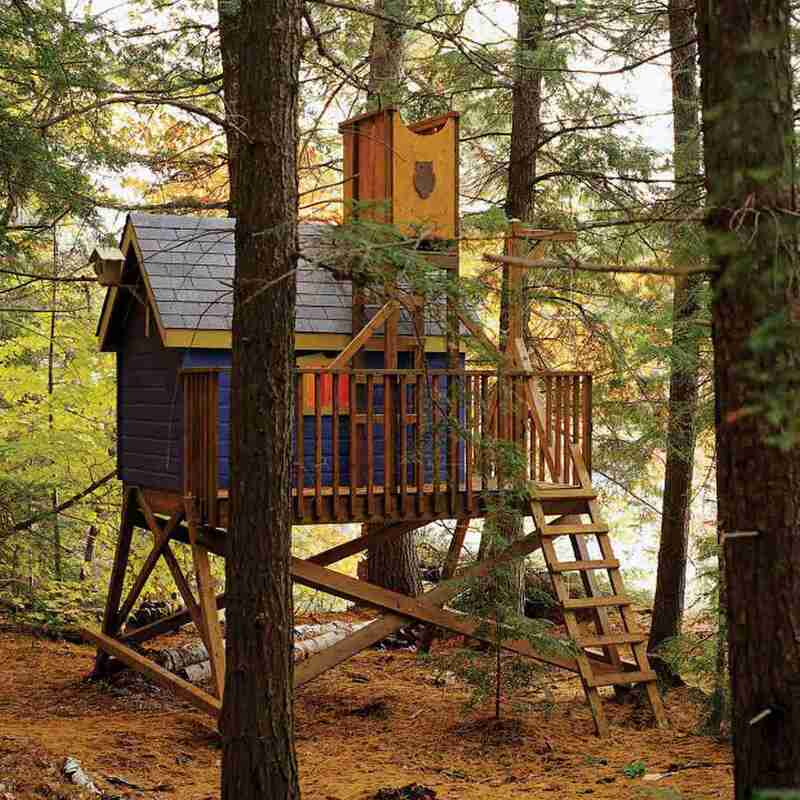 Even if you're not looking for a full step-by-step plan, there are plenty of free resources online for building your own treehouse. One of our favorites is from Family Handyman, who offers helpful tips from how to keep weight and stability in mind to how to keep the floor level and sturdy and much more.